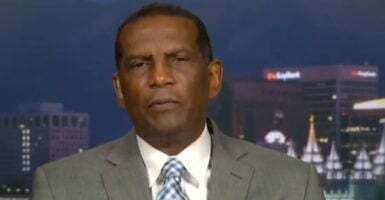 Former NFL player Burgess Owens said socialism and Marxism are pushing an “anti-white” and “anti-American” agenda that’s hurting the black community. Owens was discussing the NFL’s ratings boost as national anthem protests begin to fade and said America is fighting for its soul. “The Marxists and socialists made that so that we have these young people coming out of these environments—they’re anti-American, they’re anti-white, they’re anti-capitalist—and that is the message that now is going around the world and throughout our communities—that this is a place that’s not for black Americans,” he added. Nick Givas is a reporter for The Daily Caller News Foundation.